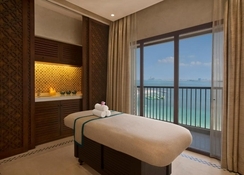 DoubleTree by Hilton Resort & Spa Marjan Island boasts a spectacular beachfront location on Marjan Island, a cluster of five man-made islands in the plush area of Al Hamra, Ras Al Khaimah. It's close to a number of shopping, entertainment and leisure venues, giving guests a plethora of things to see and do on their holidays to Dubai. All the rooms at the hotel are tastefully decorated and come with either a balcony or terrace and direct access to the beach. With a 600-metre-long private beach, 7 outdoor heated pools and an indoor ladies-only pool, water lovers will be in for a treat at DoubleTree by Hilton Resort & Spa Marjan Island. Fitness enthusiasts can work out at the excellent gym fully equipped with world-class Technogym equipment, or if you're looking for relaxation, the luxurious spa with 7 treatment rooms offers therapeutic treatment and massage. This family-friendly hotel has a kids’ club, an outdoor playground and an aqua zone with water slides to keep the little ones entertained, too. Featuring 14 stellar restaurants and bars, which includes rooftop dining and pool bar, DoubleTree by Hilton Resort & Spa Marjan Island assures a gastronomic extravaganza to all its guests. 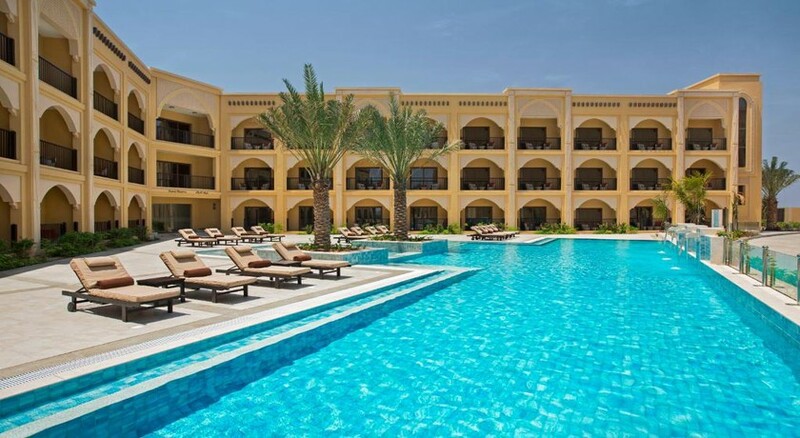 This beachfront hotel is located on Marjan Island in Ras Al Khaimah. It's close to shopping and entertainment options on the island such as Al Hamra Mall, Manar Mall, RAK Mall and Al Muairedh Souq. The Al Hamra Golf Course, Al Hamra Marina and Yacht Club, and Umm Al Quwain Motor Racing Club are also nearby for sports enthusiasts. 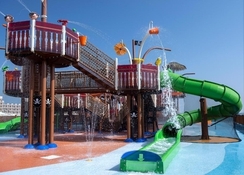 Treat the kids to the nearby Iceland Water Park, just 18.7 km away and The Ras Al Khaimah International Airport is a 20-minute drive (48km) from the hotel. 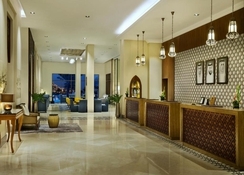 The contemporary rooms and suites at DoubleTree by Hilton Resort & Spa Marjan Island are spread over many floors. Guests can choose from 12 categories of guest rooms housed in the main and garden building equipped with either a balcony or terrace overlooking the sea or pool. All rooms feature internet access, flat-screen TV, chaise lounge and a spacious bathroom. The luxurious suites offer splendid sea views, living room with seating area, well-appointed bathroom and amenities such as phone, tea and coffee making facilities, bathtub, rainfall showers, minibar, daily housekeeping and Wi-Fi. The Bay Club beachfront villas offer premium amenities like a private beach, exclusive infinity pool, complimentary access to ladies-only spa, large shopping arcade and exclusive Bay Club restaurant and night club. The hotel also provides a number of rooms for guests with disability. DoubleTree by Hilton Resort & Spa Marjan Island is home to a slew of marvellous restaurants and bars that satiate your appetite with a range of cuisines chosen from around the world. Al Marjan is the all-day dining restaurant with breakfast, lunch and dinner buffets. Meze specialises in Turkish and Lebanese cuisines, while Sanchaya dishes up Asian delights. The Brasserie offers international cuisine for lunch and dinner, and if you’re looking for light meals and snacks, Broadwalk is the go-to place. Vespa is a great venue for family-style Italian food. The ShoFee Rooftop Lounge serves shisha and Arabic snack, while The Lobby Lounge offers light snacks, coffee, tea and other beverages. The maritime-themed Anchor restaurant and bar prepares British and European classics, to be washed down by beer and wines (available by the glass or bottle). Lounge on the private sandy beach that extends to 600 metres, or take a dip in one of the 7 outdoor heated swimming pools. There’s also an indoor pool only for ladies. 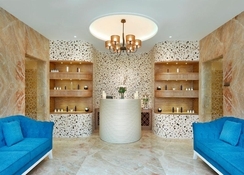 On-site spa facilities include a spa with 7 treatment rooms, sauna, steam, whirlpool and wet spa area, as well as a separate ladies-only spa with indoor pool, 2 treatment rooms and relaxation lounge. The 24-hour gym is stocked with all modern Technogym equipment. The hotel also houses a plush ballroom with 3 breakout areas, 3 meeting rooms and a foyer. 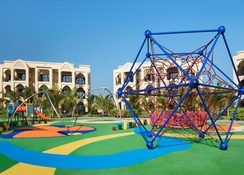 Kids can enjoy games and activities at the kids’ club which has a climbing wall and Arcade Zone, plus an outdoor playground. The Pirate Boat Aqua Zone is also a hit with little ones. Outside the hotel, you can explore the nearby shopping malls, tee off at the Al Hamra Golf Course, enjoy a fun-filled day at the Iceland Water Park, or get a bird’s-eye view of Ras al Khaimah from a micro-light plane at Jazirah Aviation Club.